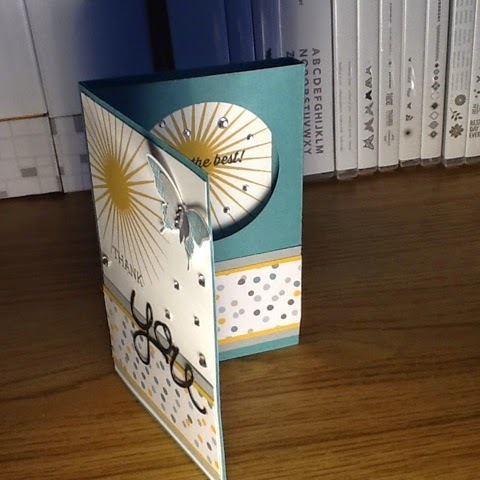 Thank you to everybody who commented on my blog last week and this simple pop-up card I showcased. As promised, I've put together a simple video tutorial on how to make it which I hope you enjoy and find useful. This is my first ever video tutorial so any constructive feedback is most welcome. Card stock, 14cm by 28.5cm or 5 1/2 inches by 11 1/4 inches. 3 3/4 inches, 7inches, 7 1/2 inches and 10 3/4 inches. If you'd like to buy any of the supplies to make this card, check out my on-line store below or give me call, I'd love to hear from you. Thanks so much for this tutorial, I plan to give it a try this evening. Thanks you so much for this tutorial and for converting the cm's into inches. It makes it a lot easier for me to read. Love the cards.